SURREY, BC & BARRIE, ON – Central City Brewing in British Columbia and Flying Monkeys Craft Brewery in Ontario have announced details of a new pan-provincial collaboration beer. The Canadian flag – red in the east; red in the west. Double Red. A perfect style for the “East meets West” collaboration born at the 2012 Session Toronto Craft Beer Festival between BC’s Central City Brewers & Distillers and Ontario’s Flying Monkeys Craft Brewery. 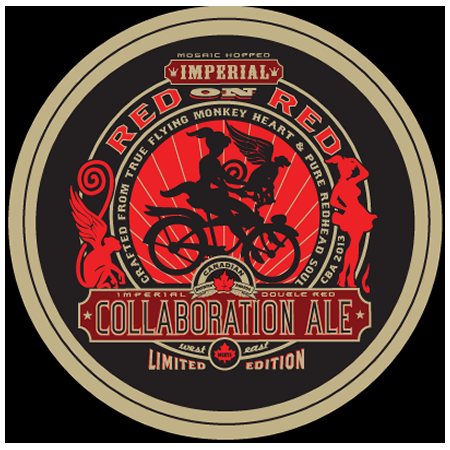 This Limited Edition Double Red Ale has been single-hopped using the first release of the brand new “Mosaic” hops bringing out floral notes of Papaya and Guava, creating a unique flavour and aroma when married with the Pale, Munich and Three Crystal malts. The first batch of Red On Red was brewed at Central City, and will be released soon in a limited run of bottles available at select private liquor stores in BC, and on tap at the Central City Brewpub. A second batch will be brewed soon at Flying Monkeys, and will be released in Ontario sometime this summer, with format and distribution details to be confirmed. Flying Monkeys has confirmed that brewers from Central City will be visiting them soon to brew a batch for Ontario release this summer. I’ve updated to post to note this.